Knowing how to use a router is probably one of the most necessary skills a woodworker needs. If you know how to use a router properly, you will be able to do all sorts of work such as joinery, grooves, rabbets, raised panels and put edge designs on the wood. Routers can be dangerous if not handled properly, so you do have to practice when leaning how to use a router. There are certain things you should know when using the router for woodworking projects. You should always use sharp drill bits, because dull bits make the work much harder. You have to clamp the wood securely so that it doesn’t fly away from the router or that you don’t spoil your work. When fastening wood to the workbench, make sure that the wood used is the same thickness as the piece of wood you are using on the router. When using a router for woodworking projects, feed the router from left to right, so that the cutting edge of the bit is the first to meet the wood. You should also make shallow passes and do not push on the router, because this slows it down. If you know how to use a router manually the proper way you will also enjoy the benefits of using a good router table. There is a double track along the front edge – one slot for a miter gauge and the other for feather boards. 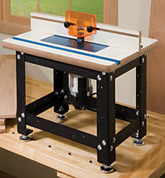 The Benchtop router table with this feature has a fence available that has the same t-slot for mounting feather boards as other guards and accessories. The insert plate of the bench dog router table is mounted nearer to the front rather than in the center of the table. This feature of the benchtop router table allows the worker to have the work up close when working on small pieces, working from the side. If you flip the fence to face the back of the table, you can work on the wide side of the bench dog router table. Since a router is indispensable when doing intricate woodworking, it only makes sense that you know how to use a router.